Schrag Animal Clinic is proud to serve the Oklahoma City OK area for everything pet related. Our veterinary hospital is run by Dr. Jan Ashmore and Dr. James Flinchbaugh, who are licensed, experienced Oklahoma City veterinarians. Our team is committed to educating our clients in how to keep your pets healthy year round, with good nutrition and exercise. Schrag Animal Clinic stays on top of the latest advances in veterinarian technology and above all, remembers that all animals and pets need to be treated with loving care in every check-up, procedure, or surgery. Dr. Jan Ashmore and Dr. James Flinchbaugh are our two full time veterinarians. Dr. Ashmore has been at Schrag Animal Clinic since 1995. She is from Oklahoma City, and received her Doctorate of Veterinary Medicine from Oklahoma State University. Dr. Ashmore has 5 beloved pets at home, Winchester, Artemis, Charlie, Autumn and Wizard. She loves Supernatural, the show! She is restoring a 1967 Impala, just like the car that is on that show. She also loves mountain biking and scrapbooking. When asked if she has a favorite species, her reply was, "All creatures great and small!" Dr. Ashmore would like everyone to know how important dental care is for their pets. Dental disease is the #1 diagnosed medical condition in cats and dogs and can lead to multiple other health issues. She would also like all pet owners to know that a trained pet = a happy family! And her favorite thing about her job? No two days are the same! Dr. Flinchbaugh has been with Schrag Animal Clinic since 2016. He was born and raised in Manhattan, Kansas, and moved to Oklahoma 15 years ago. He received his Doctorate of Veterinary Medicine from Kansas State University. He has 4 dogs, Pria, Sif, Eris and Rosie, 5 cats, Kianga, Pumba, Gracie, LilBit and Bomani, an African Grey parrot named Joe, a very entertaining Quaker parrot named Barney, amongst a few other rescued animals at home. He is often put to work by his wife treating her rescue kittens. Dr. Flinchbaugh loves to go camping, hiking and fishing. His favorite breed of dog is the Chesapeake Bay Retriever. He loves their loyalty, their quirkiness, and their sheer determination. 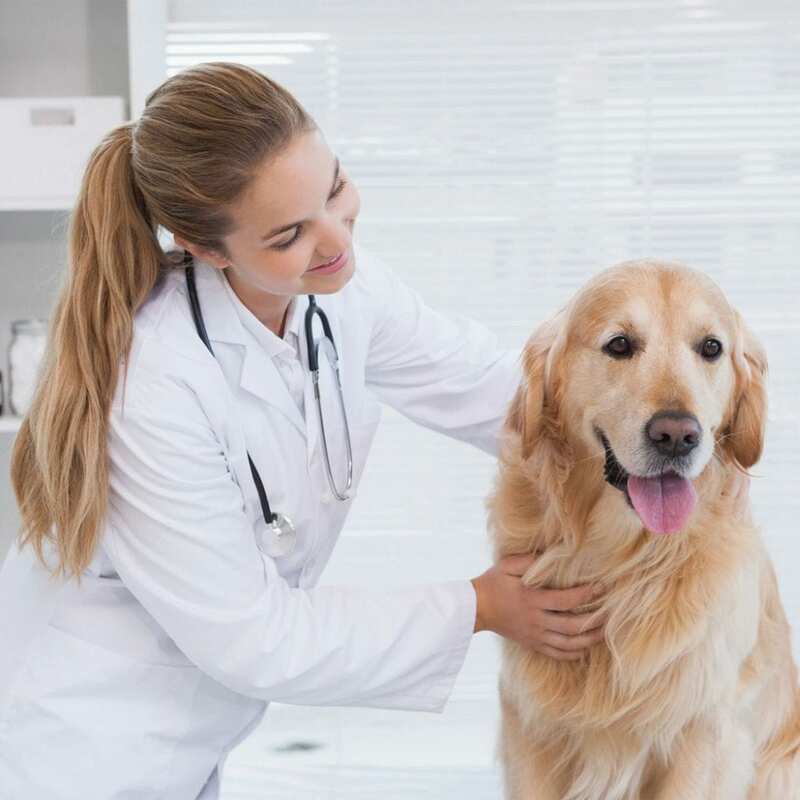 He would like all pet owners to know that there is a much higher success rate of treating patients early in the course of an illness than there is if treatment is not initiated until later on. Preventative care is the most effective medical care veterinarians can provide. And what is his favorite part of being a veterinarian? Seeing patients who have a serious illness respond well to treatment. Say hello to Amber! Amber, who is from Oklahoma City, has been a receptionist with us since 2005. She always has a smile on her face! Amber has 4 dogs, 2 cats and a bunny rabbit at home. She enjoys crafting and spending time with her family. When asked what her favorite species of animal is, she replied, "Anything with short legs and big ears! "She wants to remind pet owner's the importance of having your pet fully vaccinated by a licensed veterinarian, both when they are babies as well as throughout their lives. She also wants to remind everyone to spay and neuter your pets! This not only helps with the severe pet overpopulation problem, but also has health benefits for your furry companion. Amber enjoys interacting with clients and meeting new clients on a personal level. Please say hello to Rhonda! Rhonda is one of our receptionists at Schrag Animal Clinic. She has been greeting and taking care of our clients since 2010. She is from right here in Oklahoma City, Ok. Rhonda is a caring, fun and hardworking individual. She has 2 dogs and 2 cats at home. She loves gardening, crochet and photography. Rhonda's favorite species is the dog, because "they aren't just pets, they are companions." When I asked Rhonda what one thing she wished people knew about vet care for their pets, she said, "How important vaccines are. It's hard watching a dog suffer with something that could have been avoided." Her top tip for pet owners: "As Bob Barker would say, please spay/neuter your pets." Rhonda's favorite part of her job is being able to care for animals on a daily basis, Rhonda is a smiling face in our clinic, always ready to take care of the next client that comes in. She is truly a huge asset to what we do. Say Hello to Krystal Kirkland, RVT. Krystal is our Registered Veterinary Technician. She has been with us since 2002. Krystal is from Pocasset, Oklahoma. She graduated from Murray State College. Not only does she take amazing care of the patients at our clinic, she then goes home to care for her dogs, cats, horses, hedgehog, African spurred tortoise and chickens. In her spare time, Krystal loves to show horses, cook and sew. When asked what her favorite species of animal is, she responded, "Equine would be my favorite species, but I like them all." One thing Krystal would like for everyone to know is how important it is to have your pets fully vaccinated on a yearly basis and how important it is to have your puppies vaccinated on time. Krystal makes sure things run smoothly on a daily basis at our clinic. We greatly appreciate Krystal and all her knowledge and hard work! Say hello to Elisha! Elisha is a veterinary assistant and has been with us since 2014. She is from Oklahoma City, OK. When asked how she would describe herself, she replied, "I am a mother of two amazing children and I have been married 14 years. I love animals and I am extremely lucky I work in the field I have always dreamed of." Elisha has multiple pets at home: Bandit, Suzy and Batman are her dogs and her cats are Smokey, Rosie, Mouse and Julia. Elisha enjoys sewing and online gaming and loves to play board games and spend time with her family. Golden retrievers are her favorite breed of canine. She loves their loyalty and how great they are with kids. Elisha would like to remind all pet owners that preventive medicine is crucial to the well being of your pet. Her top tip is to schedule regular dental exams for your pet. They are very important to the overall health of your animals. Dental disease is the #1 diagnosed disease in animals and is one of the leading causes of heart disease in dogs. It can also lead to kidney disease, liver disease and other potentially serious health issues. When asked what her favorite part of her job is, she replied, "I really enjoy working with animals. The best part for me is when animals are sick and we can send them home feeling better and make our clients feel at ease."" Lorrie is one of our vet assistants and has been with us since 2006, and has been in the veterinary field for 30 years, with several of those 30 years with an internal medicine specialist. She enjoys taking care of our patients and helping to educate our clients about their pet's health. Lorrie is from Oklahoma and attended OCCC. Lorrie says, "I have 4 pit-bull terriers and one little mixed breed terrier that has come to work with me every day that I have been at Schrag Animal Clinic. Each day at 5:30 on the dot, he howls out to let all of us know it is getting close to 6:00. I have an old black cat who deserves an honorable mention. He has helped raise all the animals in our house for the last 15 years and has done a wonderful job of keeping everyone in line! I almost forgot Theo, my very lazy turtle." When asked what her favorite species is, Lorrie replied, "I love all species of animals. I am partial to large breed dogs. If I had to pick a favorite breed I would just pick one of each!" Lorrie's biggest hobby is her new business adventure. She creates Cremation Pendants for people who have lost their beloved pets and would like to be able to keep their pet close to their heart after their passing. Having said goodbye to many of her own pets, she said she knows the pain felt in our hearts when they are gone. So, inspired by the love of her own pets and the love our clients have for their pets, she started Unique Cremation Pendants. Each pendant is special and designed especially for each individual person and their pet. Whether a person chooses hair or ashes of their beloved companion, it is a beautiful way to remember the precious little soul who passed through our life. Lorrie would like to remind all pet owner's that yearly exams are one of the most important things we can do for our pets, especially as they become seniors. Screening our senior pets for potential health issues early helps them lead healthier, happier, longer lives. Her top tip for all pet owner's is to microchip you furry friends! Remember to keep your information updated with the microchip company at all times. She also reminds us to keep a collar with ID tags that have a current phone number on our pets at all times. Also include your veterinarian's number on the ID tag so the vet can keep your pet safe if you aren't immediately available to pick up your lost pet. Knowing that every day, the employees at Schrag Animal Clinic do everything they can to keep their patients as healthy as they can be is Lorrie's favorite part of her job. Sarah was born in Chicago Illinois and raised in Moore Oklahoma. She has been a vet assistant for 10+ years, with 2 years of shelter medicine, 2 1/2 years of emergency medicine, and 6 years of general practice where I have been continuing with Schrag Animal Clinic since 2018. Sarah’s hobbies are being a mom to her beloved Atlas who is an American Staffordshire and boxer mix and her 2 cats, Kamora and Pan and let's not forget her diva ferret Kahlessi. Sarah would like our clients to know the importance of preventive care including vaccinations, heart-worm, flea, and tick prevention and doing blood profiles when your dog is healthy to help detect certain diseases early, like kidney or liver failure, and getting your pet spayed or neutered, and living by the motto adopt don't shop. She also Stated “Another thing I would like to tell my clients is the importance of working with your animal to get them used to vet visits. Some tips would be getting your animal socialized with other people and animals flipping over their ears checking teeth and playing with their paws.” What she loves about her job is the experience she gets working with all types of animals and being able to help animals in their time of need. And being in a facility where her coworkers and clients are a big family. Amy joined our team in 2018 and has become a valued member. She is one or our Kennel Assistants and helps to make the clinic run smoothly. She describes herself as a “Kind and dedicated person who loves to laugh” She will be attending Veterinary Technician training starting fall of 2018 at OSU OKC. Amy enjoys writing, archery, reading, learning new crafts and playing in the SCA (Society for Creative Anachronism)!She would like to remind all pet owners to microchip their pets, “It could save your pet’s life if they ever get lost! ”When Asked what she likes best about her job, she answered, “I love going home knowing I made a difference. I helped someone’s pet feel better.